While I've been doing a lot of babywearing this winter I've been prioritising my cardigans over my leather jackets. I'm lucky to have a little collection of cardigans that are keeping me cosy. And they look great with jeans, a SAHM staple! Last time I wore this scarf I wore it with stripes too! It was the perfect accessory to add a little more colour to my mostly black outfit. Nice and simple for running a few quick errands. It's been a while since I've worn this top and cardigan, but wearing them has reminded me how much I like them and they are definitely staying in my wardrobe. Need to try wear them more often! The only thing I didn't like about this outfit was my shoe choice. It looks fine but I had pretty cold feet, should have stuck with boots. Last worn: Ray-Ban Wayfarer, black cardigan, printed scarf, striped tee, skinny jeans, ballet flats, Louis Vuitton speedy bandouliere. Other ways to wear: black cardigan and plaid shirt, printed scarf and a dress, striped tee and a baby bump, black skinny jeans in spring, ballet flats and a maxi skirt, Louis Vuitton speedy bandouliere in the office. Final reductions and up to 70% off in the Matches Fashion sale! Get an extra 20% off selected items with code 'EXTRA20'. Extra discount only available on items marked 'Extra 20% off'. I recently rediscovered this long sleeve henley along with a bunch of other winter clothing. I knew I wanted to wear it, but when the clean jeans available were these blue ones I worried it was a bit too monochromatic. We were in a rush for playgroup and I didn't have a lot of time, so I went for a favourite colour combination and picked a purple scarf to try break up all the blue. I really wasn't a fan of this outfit though, I wished I'd spent more time to pick something else out. The blue top and jeans were just too similarly coloured. Even with the grey cardi and scarf I felt too matchy-matchy. I have this same top in black, wish I would have worn that instead. It looks okay in the photo but I wasn't happy in it, so a bit of an outfit fail for me. I haven't been able to find when I last wore this tee on the blog either so either I didn't label it correctly or I haven't worn it in over 4 years! It's definitely leaving my wardrobe. 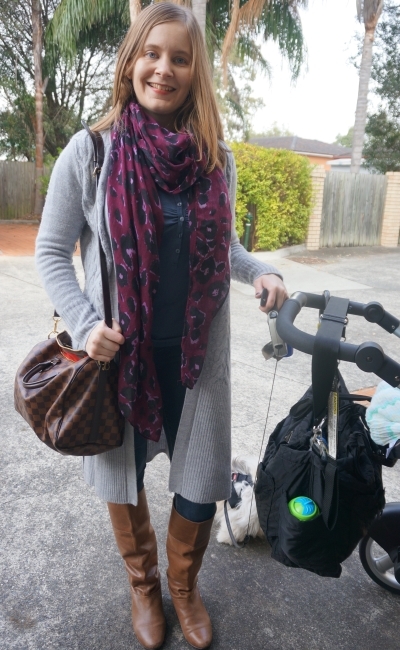 Last worn: grey cardigan, purple leopard print scarf, Prima skinny jeans, leather boots, Louis Vuitton speedy bag (above), Eliz-A-Baby nappy bag. Can't find when I last wore the henley. Other ways to wear: grey cardigan and printed jeans, leopard print scarf and a printed dress, Prima skinny jeans and a tweed jacket, leather boots and a dress, Louis Vuitton speedy bandouliere and a maxi skirt, black baby bag and green tank. Linking up with What I Wore, Cappuccino & Fashion, Fresh Fashion, Oh Hey Girl, Throwback Thursday. Thanks! I think it helped, but like you said it's more about how you feel in an outfit. I personally don't think the second outfit looks too matchy-matchy, but as you say it may have looked a little different if you didn't have the cardi on. Most of my clothes are navy so I come up against this problem frequently... I think I need to branch out into a new colour! 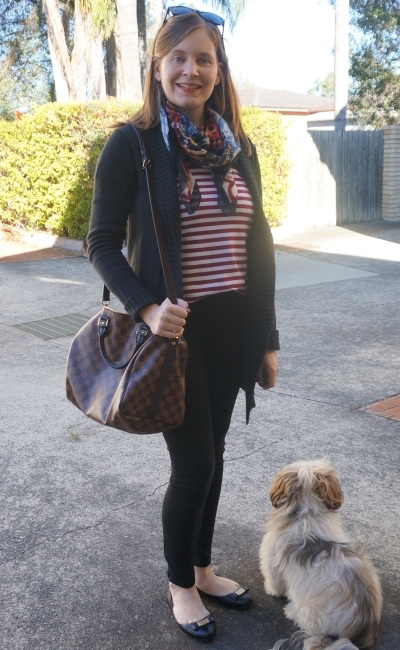 You know I love love love stripes, so #1 is a winner for me ;) love both looks, Mica and that bag is awesome. I love both cardigans! They're the perfect layering piece and great for Fall. I love how cozy it looks! Cardigans really are the best! And they can work for all season! (well, not super thick ones, haha) Love both of these! I love the tall brown boots with the grey cardigan! Cardigans are a bit more flexible IMO. They can be worn during the summer and won't get too hot. They are also appropriate for the office, which is a major plus since it's always cold. I actually love the 2nd outfit! Yes I always need one in the office as the aircon is so cold! I like the second outfit, but the first is definitely my favorite. Something about that striped top with the scarf makes it feel so Parisian and chic. Love it! You look so cute and cozy! Loving that bag! Also those boots are fabulous! I love my cardigans and I agree, they are perfect fr baby wearing. Thanks Kay! They look alright, but they just weren't as warm as boots, haha! I don't think the second outfit as bad as you thought, I actually love it better than the first outfit. Love your scarves first of all! I love your red and white striped t shirt last in your first pic! I just have a thing for anything stripes! I like the nautical feel of the first look and striped tops are always such a classic. I get why you thought the second look matchy matchy but it doesn't really come across that way at all. I carry a cardigan in my bag during the summer for places where the air conditioning is too strong. Looking at your outfits have me itching for fall here! So cozy! I hate when I think flats are a good idea in winter! haha I have done it! I need to find some good boots this year, because I got ride of all but one pair over the Spring. It was just "time" for most of them. Blue is my favorite color, but one of the hardest to wear. I love my jeans, but I hate the blue on blue clash. I totally understand! I did the same a year or so ago, got rid of all the boots and bought replacements. Haven't worn them much this year though, but might makeup for it in spring. Oh!!! 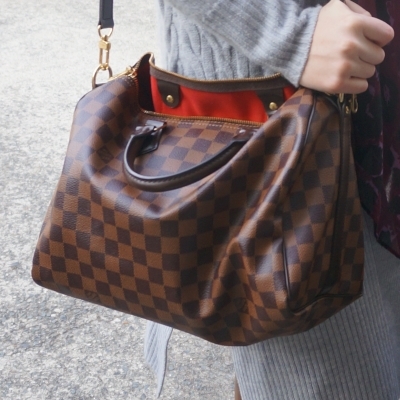 Your LV bag is gorgeous and so is that scarf! 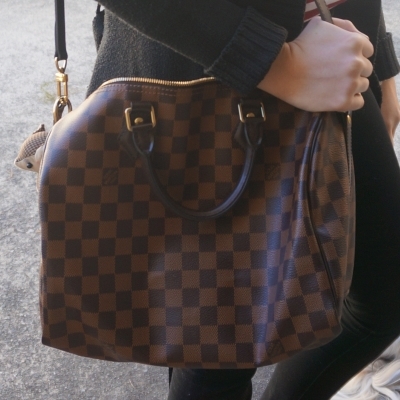 I love LV so much, I'm desperate for one of their new bags, I have my eye on the Louise style! Have you seen it? Mica, I would say that all the pieces you are wearing: skinny jeans, tall flat boots, a big crossobody bag, scarves, easy tops and long cozy cardigans - are all perfect staples in the wardrobe of a SAHM or a mom in general. Both outfits are great. I am especially fond of the second one. =) Hope you and your boys are having an easy Winter in AUS. Welcome by and linkup with me on a new Thursday Moda today. I miss having you linkup with me. =) Thanks and have a great day and weekend! Love the look, stunning bag too! Mica, you ROCK Skinny Jeans! I love BOTH outfits girl! Gorgeous cardigans! Love that striped shirt and also love the boots with your skinny jeans. Two great looks. Honestly I am loving that second outfit. I didn't really notice how closely the top and jeans matched, what drew my eye is that fabulous statement scarf and how nicely it pairs with your cardigan. You definitely should wear those two pieces together again! That first outfit is super cute. I love red stripes but haven't found how to wear them without looking too Where's Wally. Scarf is perfection. Pity you weren't down with the second outfit but if it cements a decision to move something on, then that's a good outcome! What I like the most about your winter is seeing many many of your gorgeous scarves!! I prefer to wear long cozy cardigans over jackets since they just move a lot easier. Love the first look! Whenever I see you wear your Speedy I ask myself why I did not buy one when I had the chance... Its such a great bag to own.